Happy Birthday to all you Moonchildren with your Sun between 0 – 9.59° Cancer. Your birthdays range roughly from June 20-30 depending on the year and ~ being first decan Cancers ~ you are both ruled and subruled by the Moon. You are among the purest lunar types of the zodiac. If you are a New Moon baby, you have both your Sun and Moon in very close degree. No one has more inherent lunar energy than you ~ unless you meet a first decan New Moon Cancerian with their Sun and Moon in the 4th house. They’re the winner, hands down. You are most likely super-sensitive to your surroundings, with excellent intuition, and ~ you’ve heard it before ~ you probably feel like a psychic sponge at times. Of course you’ve been called moody! You’ve got the fastest energy of our zodiac zipping through you like lightning in a bottle. If you already have this much Cancer energy coursing through your claws, you’ll have even more with additional planets in Cancer. How Can You Handle all that Lunar Energy? It’s important to have ways to dispel that intuitive, receptive energy when you get overloaded. Ground yourself. Earth and water are very friendly elements. Look to your opposite sign, Capricorn, to get your feet back on the ground when you feel like you’re being swept away by the cosmic tides. Take charge of yourself, be in control of those emotions, get in balance. Make your emotions serve you. If you’re a Full Moon baby, you’re already familiar with this dual energy since you have Sun in Cancer and Moon in Capricorn. If you are a first decan Cancer, the tarot card related to your birthday is the beautiful 2 of Cups. Numerologically, the Moon is associated with the number 2, so we see the Moon’s influence in this card. It is an extremely feminine card, being lunar in nature and a 2. Both the Moon and the 2 are receptive symbols, often preferring to be the supportive partner rather than the leader or dominant force. The card is often seen as quite romantic and some readers associate it with love affairs and marriage. It has a deeper meaning than marriage, though, and that’s the ability to form a true union with another. Marriage does not necessarily guarantee that. Twos represent duality, partnership, and ultimately union. 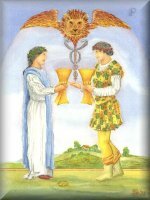 Water, of course, represents our emotions and the 2 of cups will be indicative of some kind of emotional involvement. Water reflects ~ just as the Moon reflects the light of the Sun. Be careful not to put yourself in the role of playing the doormat, though. Everyone must find a little light of their own. When you join with another ~ whether in a marriage, a friendship, parent/child relationships, in-laws, or business arrangements ~ you have to work together. Otherwise, you’re on your own and, obviously, you can’t have a partnership by yourself. No one can do all the giving all the time. If you find yourself in an unfulfilling relationship, understand the real reason you are choosing to stay ~ why you have made that choice. If you are a Cancerian born on the 2nd, 11th, or 20th, this card has double impact for you, since you are strongly influenced by the qualities of 2 and the Moon. What are your feelings about your partnerships? Do your partnerships need adjustment? How strong are your commitments? You can use this card as a reminder to honor your partnerships and unions, but to retain your individuality. If all this talk of partnership and the 2 of Cups is starting to sound rather Venusian, you can understand why the Golden Dawn assigned Venus in Cancer to this card. If you do this and decide to share it with us, please send a pic to me and I’ll upload it for you. This is a random question, and has nothing, really, to do with this post but…I noticed that the solstice, summer and winter, occurred on later dates on earlier years. For example, the Sun entered Cancer very late on June 22 in 1943. Is this due to the extra day we allow on leap years? Great question. I did a quick search and found this article, Time Fact Files, Equinoxes and Solstices. It has to do with a 400 year cycle of leap years. I also found a list of leap years and ’43 wasn’t one, but ’44 was. Thanks,cj. Interesting info. Answers my question! I’ve been having a conversation with my brother about the summer solstice and Midsummer.